The fitness industry is evolving. And with it, coaching is evolving too. People aren’t just looking for ‘personal trainers’ or ‘nutritionists’ anymore — they’re looking for well-rounded coaches who can help them look, feel, and live better, in a way that lasts. That’s why modern health and fitness pros are learning more about nutrition than ever before; they’re reading books, taking courses, and getting certified. 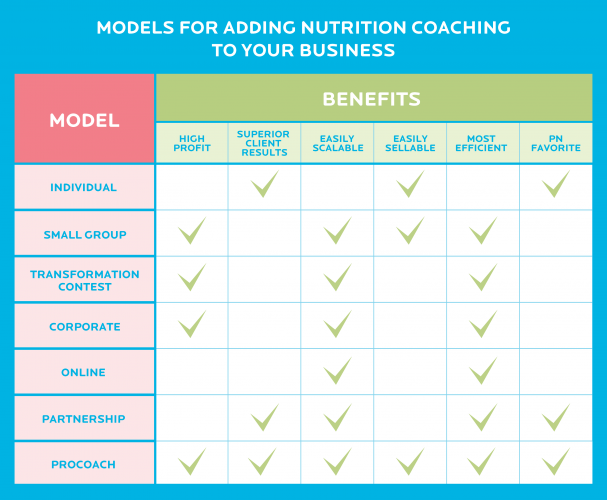 In it, you’ll learn 7 proven models for adding nutrition coaching to your practice. (Or, if you’re just beginning, how to offer it right from the start). These come from some of the industry’s top experts, including Alwyn Cosgrove, Jonathan Goodman, Sean Greeley, Pat Rigsby, and yours truly. All of the strategies here are proven and expert-vetted — so you really can’t go wrong with any of them. Still, they all have pros and cons. One model might be a lot more effective for, or better suited to, you (and the people you help) right now. For many coaches, working one-on-one with clients is a good start. In the individual model, you present yourself to clients as a well-rounded lifestyle coach — and deliver on that promise. Then, begin your nutrition coaching practice (simply adding it to the training, therapy, or other services you’re offering if you’re already in business). Value that session equal to what you’d value a training/workout session if you currently provide that. For example, if you charge $100/session for fitness training, you’ll charge $100/session for nutrition coaching. Option 2: If you’re adding nutrition to an existing business, tack on 15 minutes to each client training session. Do this ideally at the start of the session, before your client is tired. Meet in a quiet place. Don’t do this while your client is foam rolling or warming up. Factor this extra time into your price per session. For example, if you charge $100 per session, consider charging $125 for a session that includes nutrition assessment and consultation. Probably not. As current (and prospective) clients see the tremendous value this sort of holistic coaching provides — and begin to see you as an elite-level, well-rounded coach — they’ll be more eager than ever to work with you. However, even if you did lose a few clients at first (which isn’t likely), you’ll begin attracting clients who are really ready for change, and willing to commit. Of course, that means you’ll get better results, and a better shot at establishing a great reputation, not to mention the income that reflects what you’re really worth. This would involve tracking the things important to your client. It could be objective things like weight, girths, skinfolds, photos and food intake. Or subjective things like mood and perceived health. During the prior week or two, you should have assigned new habits or practices for your clients to work on. Review how they’ve done with those practices, celebrate all successes, and talk through any challenges around those habits. Most clients tend to focus on how far their goals are ahead of them, and how much time, effort, and work still remains. Change their focus by looking backwards and reframing the future as a set of opportunities. Together with your client, collaborate on what to do next. As part of your decision-making process, consider your client’s progress, their changing goals, current sticking points, and what feels most important and/or urgent to them. Easy to get started. If you have training clients, you have potential nutrition clients too. Simple integration with existing services. You’ll still be leaps and bounds ahead of the run-of-the-mill trainers out there because you’ll be coaching people to better, lasting change. You’ll have real results to show for your efforts — and you’ll be able to charge for it. Unlike the individual model, the small group model lets you coach several people simultaneously in the same session. The sessions are held at a regular, recurring time, and everyone works together. Usually, there’s also a finite endpoint (such as an 8-week or 12-week program). This is also a nice way to make the most of your time. You’re spending an hour (or whatever) regardless; 10 people paying $20 each will yield twice the revenue of 1 client paying $100 for that same hour. Clients may also prefer to trade off one-on-one attention for a cheaper price — or simply like the idea that they’re sharing the journey with others. Step 1: Add nutrition classes to your existing fitness business. If you have existing training clients, you can suggest that for an additional fee, they join your small group nutrition class. Encourage uptake of the nutrition program by offering a free “entry level” nutrition starter class or kit when a client signs up with the gym if you work in one. For example, at Results Fitness, every new client gets a “Phase 1” nutrition program that includes some initial habit-based coaching with bonus tools (like a food journal). From there, Cosgrove estimates that 90% of clients upgrade to the 8-week small group program. Feel free to experiment and discover the “winning formula” that works for your own coaching style and client base. Class size can vary depending on your client base and comfort level. However, generally, 5-25 clients per nutrition class is ideal. Accountability generally involves reviewing whether the client has met their stated goals from the last session and identifying what the client will commit to working on for the next period of time. Have clients sign a visibly placed whiteboard. By doing so, they’re committing to the week’s habit. Social support: We also know clients are more likely to stick with the program if they have peers, friends or family with similar habits. A group model can provide a community feel and give clients a sense of support. They’ll keep coming back (and re-subscribing to your program) because they want to remain a part of the community. Throughout the pre-specified time frame of the program, you’ll deliver a combination of email coaching and in-person (or online) educational workshops. For example, you might send out a new email every Monday with that week’s program (i.e. workouts and nutritional habits), plus follow-up emails throughout the week. In addition, you might host weekly in-person workshops or webinars throughout the program that discusses nutritional habits in more detail. If the goal is a physical transformation, set times for in-person measurements throughout the program. If the goal is an athletic achievement, set times for group workouts or “fitness tests”. Immediate cash influx and long-term financial benefit: You’re both enhancing the value of existing clients by getting them to pay for a new service, and bringing in new clients who may sign up for other programs/training with you. Enables you to deliver nutrition coaching and fitness coaching together in a structured way. This may be a good model if you want to incorporate some nutrition coaching into your work but aren’t ready to transfer it to your standard programs/training models. In the corporate training model, you’ll provide nutrition coaching to a workplace (either a whole company or a specific department). Step 1: Choose how many clients you want. Your goal number of clients should depend on what you are trying to accomplish. Are you starting an online-only business? Is this supplemental to other projects, or will it be your full-time work? Up to around 30 or 40 people seems to be manageable without special software. Beyond that point, you may wish to use a special software system to help manage clients and content delivery. Step 2: Choose your speciality or “niche”. Efficient online nutrition coaching requires you to focus and establish templates for client “type”. Pick no more than 3 types of clients you want to include in your online program. Women in their 30s who recently had a baby. Ask potential clients to fill out a questionnaire. You can set up a simple survey online using a system such as Survey Monkey. Step 4: Create 3-4 phases of programming for each client type. Each client in the same category will receive a similar program, tailored slightly for them, based on their questionnaire answers. For example, at the end of the week, the client can send you their food journal, or their update on what habits they kept, etc. You can schedule a time to review your email and check off your client’s’ compliance using your favourite method (e.g. a whiteboard or spreadsheet). Schedule your time carefully. Set up regular appointments for yourself for when you will send materials to clients, when you will check email or conduct accountability check-ins, schedule follow-ups, etc. Once you get a broader scope of clients, you may look at buying software to help you deliver nutrition coaching materials to clients. It can save you time and money… if you do it right. Remember, online training doesn’t have to be a big business; it can be a great adjunct to an existing in-person training business. For example, if you are training at a gym and want to try combining nutrition coaching with fitness, this can be a good way to do that on the side. You reach the people who need you. Online training is a great way to reach people who need the help, such as people who can’t afford gym memberships or personal training, or who are intimidated by gyms. It’s more accessible for many people. More flexibility. Online training can give you more freedom for how and when you train, allowing you to block off time according to your own schedule and use your preferred ways of working. Just remember, in order to save you time, you must work efficiently and systematically. If you’re redesigning your programs for each and every person and answering email all day long, you’re probably not going to get the results or profit you hoped for. The truth is some coaches who are qualified to dispense nutrition advice(including Precision Nutrition Certified pros) decide that now isn’t the right time to formally incorporate practice-based nutrition coaching into their business. Meanwhile, you want the best for your clients. You don’t want them getting lost in diet fads or repeating harmful patterns. You want them to feel good and succeed, in and out of the gym. For example, let’s say you decide you want to partner with us. As a Precision Nutrition Certification student or graduate, you can become a referral partner of ours. You contact us, sign up for our affiliate program, and you’re given a special link to share with clients for them to learn more about Precision Nutrition Coaching. For each client you think is a good candidate, you share that link with them. And if they go on to sign up for coaching, you get paid a generous percentage of the sale. The key is to make sure they’re giving advice you actually believe in so that your clients aren’t receiving mixed messages and getting confused. Step 3: Stay in touch with the client about their nutrition coaching. Just stay informed so you have a sense of their progress and so you can make sure your programming dovetails with what’s happening on the nutrition side. You can take care of your clients. If you aren’t ready or able to offer nutrition coaching right now, you’ll know they’re getting quality support in this area. Part of being a great coach is knowing when to call in extra resources to help your client succeed. Not everything needs to come from you. You buy yourself some time. Keep working in the areas where you’re already a superstar. Meanwhile, keep learning and practising in areas you want to grow. Remember, you don’t have to do everything all at once. You make a bit of money, and/or find some new clients. A partnership can open up new opportunities and it can even make you some cash, with very little investment on your part. In this model, ProCoach delivers the Precision Nutrition Coaching curriculum to your clients, while keeping you in the driver’s seat as the coach. You sign up your clients, and ProCoach runs automatically for each person. While ProCoach delivers the programming, you are the coach. That means you can help your clients through the curriculum in whatever way you choose — whether that’s in person, entirely online, in a group setting in the gym, a corporate setting, and so on. Again, ProCoach is only available to Precision Nutrition Certified pros. We’ll be making more spots available to certified pros soon. Click here to check out our next launch date. Step 3: Register your client(s) for the program. This takes less than 30 seconds per client. The program immediately kicks off and gives your client access to their personal dashboard, from any device. Step 4: Review the client’s assessment answers. The program begins with an initial screening and assessment questionnaire. You can then review your client’s responses to get to know more about them and understand their goals. At this point, the program runs like clockwork. Clients get daily emails with short reviews and lessons about what they should be working on that day. Every two weeks they will practice a different habit, supported by daily guidance in the form of written, audio, and visual content. Every week or two, clients are asked to report markers of progress such as body weight and photos. Through your ProCoach dashboard, you will be able to review client progress. You can easily track all of your clients at a glance, and deep dive into each client’s individual progress as you wish. Step 7: Check-in and provide feedback. Provide a reliable nutrition coaching experience. You’ll deliver the same high-quality nutrition coaching experience to every single client regardless of what else is going on… in your life or your client’s. ProCoach offers our “road-tested”, evidence-based, real-world-proven system and experience for clients. We’ve put some serious mileage on it so we know it works. Scale up. (The sky’s the limit.) You’ll be able to coach 5 clients, 50 clients, or 500 clients easily — because ProCoach makes it simple. We’ve already coached more nearly 100,000 clients using this very system. Think you can handle that many clients? Go for it. The system will work, whether you have 10 clients or 10,000. Automation makes it easy. You’ll be able to deliver nutrition habits, lessons, and assignments on time and on track, no matter what else you’re doing. Whether you’re sleeping, busy, out of town, in bed with the flu, stuck in traffic or on a plane somewhere above the Pacific ocean… it doesn’t matter. You don’t have to be there all the time or married to your laptop, always wondering and worrying. The system will take care of your clients, and make sure they get what they need. Daily, weekly, and monthly check-ins and progress tracking are also automated. Then you’ll need smart tools and systems for using that knowledge to get the best results for your clients — and for your business. It may be tempting to give your nutrition knowledge away for free. Clients (and friends and family) may ask you to do so, without giving it much consideration. But if you want to make a living as a trainer or coach, you need to put a price on your nutrition coaching services — whether that’s an increased hourly rate or a special program. You also need to value your own time. The adage “time is money” is particularly true for fitness and health professionals. Be clear and specific about when you’re available to clients, and how the time will be used. Nutrition coaching really isn’t something you can wing. The best, most effective, way to use your knowledge — for the good of your clients and your business — is to have a system in place. Do you feel most inspired when interacting with clients one-on-one? Do you love the group setting because of your passion for public speaking? Are you pressed for time, making the online option most practical for you? Do you need to work with a partner or other third party for now, while you refine your nutrition knowledge and coaching skills? You don’t have to do everything all by yourself, or all at once. If you’re not quite ready to provide nutrition coaching to your clients, you may consider a partnership model. 5. Above all else, fulfil your promise. Remember why you’re doing this in the first place — you’re passionate about fitness and nutrition, and you want to use that passion to help people. That’s the biggest reason nutrition coaching belongs in a fitness business. It’s also why you have the potential to be immensely successful in this industry. Because if you deliver on the promise to help people live and feel better, you will stand out, and you will be successful.